VESA LG bracket holds a television up to 60", weighing less than 80 lbs. 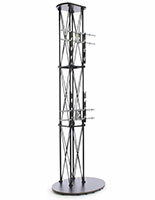 74" tall fixture keeps flat screen monitors at eye-level. 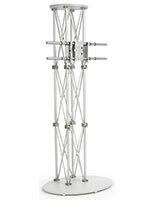 Modular, aluminum truss design with wooden base is easy to set up and transport. 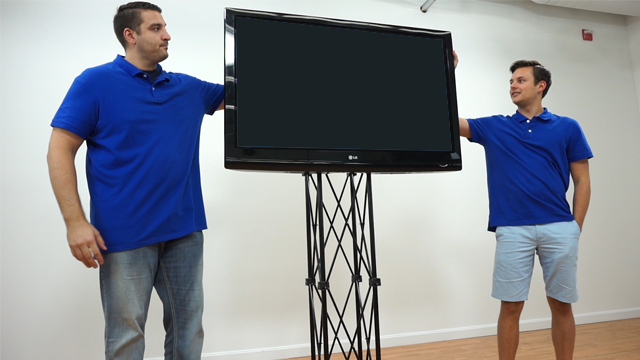 LCD TV stands, when used at trade show events, will make your presentation a cut above the competition! These LCD TV stands give you the ability to incorporate digital advertisements into a display without sacrificing your space or budget. 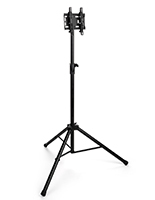 The flat screen monitor fixtures, LCD TV stands feature a knockdown truss design for portability and style. 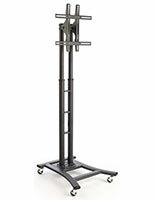 These LCD TV stands easily break down to fit into a pocketed carrying bag for travel or storage. The LCD TV stands, also known as plasma television stands, are also extremely easy to set up, as they do not require any additional hardware. 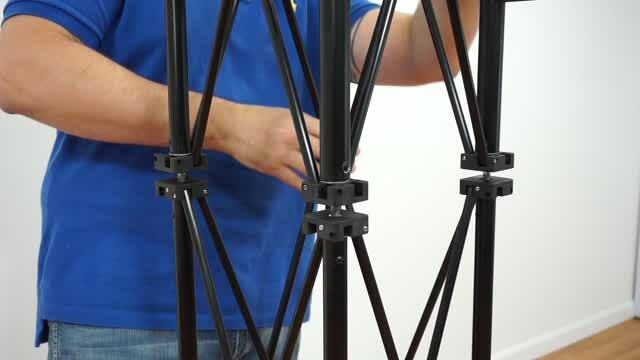 Simply screw each pole into the base and then attach a flat screen television. 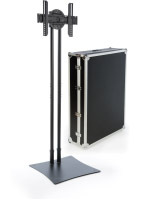 This LED mount, monitor bracket breaks-down for a transportable display ideal for tradeshows and events. LCD TV stand, television rack can mount a 60" flat screen plasma which can be seen in many locations especially created for companies that are constantly traveling and need a unit that collapses into a small carrying case. This LED bracket is VESA LG which can mount larger televisions but also maintain structure, balance and stability. Mounting a 60" flat screen television to this LCD TV stand makes this unit the best portable display that will tower over a crowd and captivate the attention of individuals across the room. This LED mount will go with any television between up to 60" as long as it weighs below 80 lbs which is basically all televisions on the market. We provide the LCD TV stands each with a VESA LG bracket for mounting a television horizontally. VESA brackets are designed with manufacturers to fit most styles of flat panel monitors, and are provided with all of the necessary hardware for a majority of television screens. 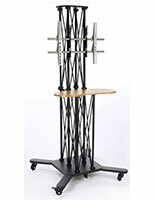 These flat TV stands, such as plasma television furniture, are capable of holding a television up to 60" in size, weighing less than 80 pounds. The flat panel screen displays, LCD TV stands are therefore perfect for use at trade shows or within busy retail stores, bank lobbies or hotel foyers! This is a great stand. 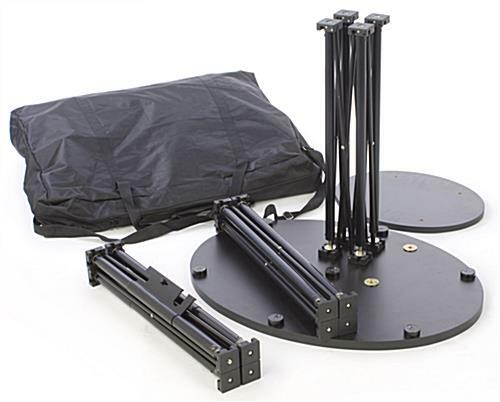 Portable, sturdy and easy to assemble. Even if your VESA pattern is 300x300 (like my 55" LG TV is) you can still use this stand by ordering an adapter kit (under $20) on Amazon.com. This is a recommended purchase for anyone needing to have a large screen TV at an event. Eed, thank you for taking the time to write this great review! We're glad that you found an adapter to make this TV stand work for your 55" LG TV. We know this will make a great addition to your event! Thank you for taking the time to leave this review. The official assembly instructions can be found here or on the product page under "Resources: Manuals, Videos, & Templates." A customer care specialist will follow-up to make sure your TV stand was properly assembled. 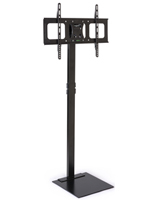 We now have 4 of these portable TV stands and they are great. 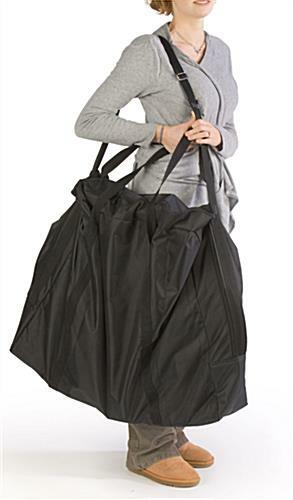 Easy to assemble and they come in a handy carry bag. They hold our large 48" TV displays with ease. Would highly recommend. Thank you so much for taking the time to write this great review, Dale! 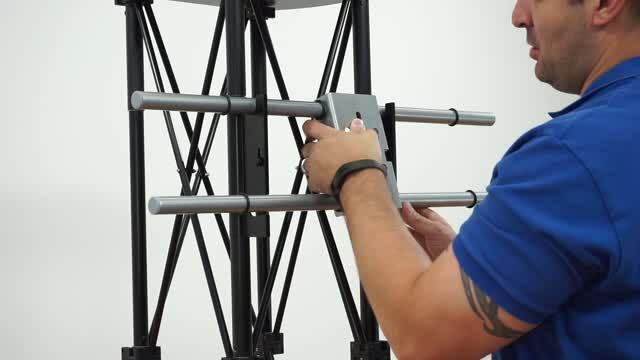 We strive to provide products that are easy-to-use and assemble, and we're so happy that these portable TV stands are the perfect solution to hold your 48" TV displays. We hope you continue to use Displays2go for your display needs! This TV stand is very stable and easily supported our 55" display monitor, mounted vertically. It was easy to put together, and breaks down to a small package for easy shipping. Would definitely buy again. I am satisfied with this product. It is heavier than in looks in the pictures and video, but overall not bad. 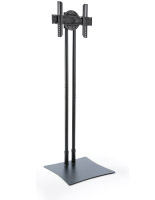 You can't really go wrong with this stand for that price. Sturdy, not dirty.